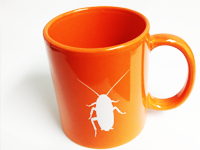 A classic orange cup with the BYB cockroach on it. Just what you need to start the day off right. . . Or keep you going late into the night!